In 1962 we introduced our first “HVAC ENGINEERING SPECIFICATION.” While the 1962 approach was very well received and filled a void, it was made up of many individual specifications rather than presented in an organized format.It had no meaningful minimum static deflection guide and engineers found it hard to work with. In 1965 we started the VCS series which was the first industry attempt to hone in on a specific group of HVAC products rather than the complete isolator range. It made it possible for the engineer to work with a small, versatile group of products and get to know them well. 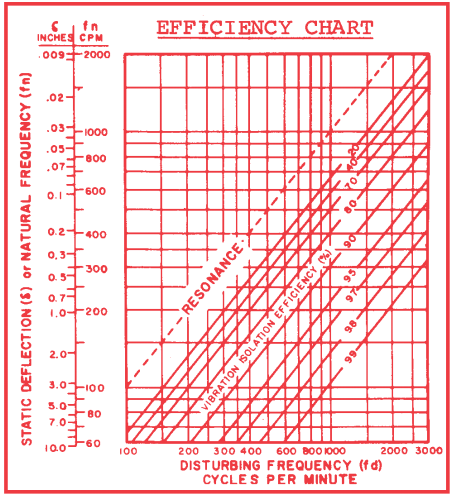 The 1965 specification included the first selection chart as an additional engineering tool highlighting the need for increased deflection in response to floor sensitivity and greater vibratory input from larger machines. These empirical suggestions written 35 years ago were based on 20 years of hands-on experience correcting bad installations on a guaranteed solution basis. The 1965 series remained virtually unchanged until 1975, when we started publishing in the present format. The 1976, 1979 and 1982 modifications, all represented better explanations, product improvement or changes in the selection guide. In this issue we have added air springs, sliding pipe guides, complete roof top spring curbs, DuPont Kevlar reinforced expansion joints, completely engineered riser systems and changes in piping supports. Hopefully, our introduction of new or improved methods will never stop. This new specification continues to incorporate the principles that have always been our guidelines. 1. The single degree of freedom mathematical Efficiency chart and equation is only a theoretical representation as it erroneously assumes great stiffness or mass under the isolators. This is not true in modern buildings. Older specifications called for a theoretical Isolation Efficiency that was usually inadequate for high speed and too conservative for low speed equipment. Static deflection requirements should be stated specifically and increased in keeping with floor deflections. For any given operating speed there will be a need for a larger spring deflection as the equipment is located in areas with longer unsupported spans because the floors become more flexible and vibration prone. Vibratory energy tends to increase with horsepower, so as a family of equipment such as pumps, become larger, there is need for more deflection. Once past a ratio of 3 between the operating speed and the natural frequency (bouncing frequency) of the spring system, vibration transmission is reduced in direct proportion to the increase in spring deflection. 2. A spring isolator should be designed to utilize large diameter springs with a horizontal stiffness that is a minimum of 75% of the vertical. For all practical purposes, this can be verified if the outside spring diameter is not less than 0.8 of the compressed height of the spring at rated load. These springs require no housing for lateral stability. While housings may be required for other reasons, such as wind load or restraint when weight changes because of water drainage, housings must be designed so they do not influence the spring frequency in any direction during normal operation. 3. Steel bases should be made rigid to maintain the alignment of the equipment and resist both belt tension and torsional forces. It is also important that base members are stiff so they resonate at much higher frequencies than those generated by the isolated equipment. Base members that resonate at disturbing vibratory frequencies can seriously complicate the vibration problem. Steel encased concrete bases provide a simpler rigid design. While adding mass will reduce vibratory motion in direct proportion to the increase in total weight, all modern HVAC equipment can be mounted directly on steel bases without excessive motion. Therefore, concrete bases should be designed for stiffness as there is no need for additional mass. 4. Isolated equipment should be made as free to move as possible and not restricted by connected piping or ductwork. While this can be done with rigid piping having multiple bends and spring hanger suspension, we believe that flexible rubber connectors still remain the most fool proof method. To do this, Kevlar reinforced double arch expansion joints are usually installed without control rods, either horizontally or vertically. If control rods must be used at very high pressures, the best mode is horizontal and parallel to the equipment shaft as they will only function radially. Flexible rubber connectors reduce noise and vibration at hydraulic pumping frequency (RPM x number of pump blades) but are ineffective at RPM. 5. Improper isolation of piping can bypass equipment support mountings. Therefore, mechanical piping should be treated as part of the machine and as much thought given to the piping isolation as to the machinery itself. Since piping is subject to expansion and dynamic forces, sometimes there is need for compromise and we must provide resilient anchors to direct piping motion, and avoid pipe stress which might lead to pipe failure or damage to the structure. We do not believe that it is always practical to completely float a riser without providing resilient anchors when there are many branch-offs that tend to bind or offer unpredictable resistance. In writing the VCS-100 specifications we have always tried to abide by the theory contained in our lecture to the ASHRAE Association and to temper this theory with studies of our successful installations and of even greater importance, record keeping of what had to be done to correct problem jobs, installed by our firm or others. The ASHRAE Lecture bulletin is immediately before this publication. In earthquake zones the information provided by VCS-100 must be supplemented with some form of snubbing and preferably with snubbers that are selected with an eye to maximum movements and accelerations as the result of a computer study of the isolated machine and the earthquake that would affect it. Supplementary snubbing information can be found in our bulletin SCS-100 and Specification Bulletins SVCS. Although engineers are generally more concerned with vibration transmission than airborne noise, there are those applications where airborne sound transmission is as important as vibration isolation. Information as to the proper design of floating floors, suspended ceilings and improved wall construction can be found in our architectural bulletin ACS-102. Since our first publication of VCS-100 in 1965, we have distributed over 350,000 copies throughout the world. These presentations formalized specification writing in our industry and the greatest compliment is not only usage, but the fact that much of the information has been copied by our competitors. This new publication presents the specifications in finished form in both disk and hard copy. It can be used as written or edited to conform with your experience.